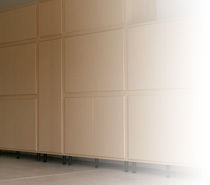 Design a garage cabinet system that fits your needs with our design center! 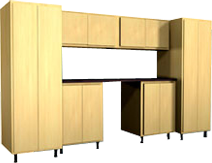 Our patented dove-tail designed cabinet makes it easy to assemble & install in just a few hours. Each Slide-Lok cabinet system comes with the necessary hardware & is accompanied by a detailed assembly & installation instructions. These storage systems are perfect for the do it yourselfers looking for a quick garage storage solution. Contact us for a free estimate and design suited for your home. 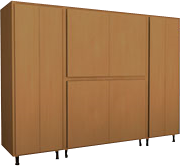 All of our garage cabinets feature: Dovetail Construction, Fully Adjustable Legs, Conceiled 6 Way Adjustable Hinges, Pre-cut Components, Pre-drilled for Adjustable Shelving and Doors, Simple assembly & Installation Instructions.